How to Use iPhone as Hard Drive & Enable iPhone Disk Mode? How do I use my iPhone as a USB flash drive without iTunes? Let me guess - you must be messing around with your USB flash drives and cannot find a single one of them when you are in a desperate need! For most Android users, this won't be a problem as they can always spare out more internal storage space to store files as large as 3GB, and use the smart phone as a USB hard drive. But for iPhone device holders, Apple has made things difficult. The lack of file-management tidbit has made stale the whole journey. Interesting enough, there is actually a mind-blowing simple way to turn your iPhone into a portable storage device, free. How to Enable iPhone Disk Mode & Use It as USB Flash Drive? The tool provides one of the easiest and most dummy-proof ways to enable iPhone disk mode for free, and turn iPhone into a flash drive to transfer files between Windows, iPhone/iPad and Mac computers. 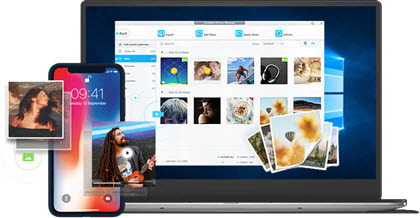 Simply connect iPhone as a storage device, you can access iPhone hard drive from DearMob to move all your Word documents, Excels files and PowerPoint documents in and out from your iPhone portable storage. Easy and intuitive. 2. How to Active iPhone Disk Mode and Connect Your iPhone as A Storage Device? You may think that your iPhone/iPad can be used as removable hard drive once discovered by Windows computer as a Portable Device. You are very wrong. Just try it yourself by saving a word document to the iPhone internal storage. You will get the same result as I did - "You can't save here. Please choose another location." How to Active iPhone Disk Mode and Connect Your iPhone as A Storage Device? DearMob iPhone Manager offers FREE service to turn your iPhone into a USB drive! 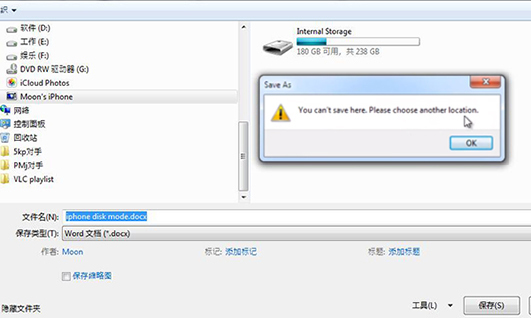 It is basically an iPhone file management tool, but can let your access iPhone hard drive from both Windows and Mac. You can, in the meantime, manage your iWork Apple documents in Files, and take control of any iOS-compatible/incompatible files including Adobe Photoshop files, Lightroom files, Zip/RAR compressed files, Maya files, Word/Excel/PowerPoint documents, APK files, DMG/EXE files, etc. Modify, export, delete, create new, your iPhone/iPad can be used totally as a portable hard drive whenever you want, totally for free. Step 2. Open this iPhone disk mode activator. Step 3. Click on "Flash Drive" tab to access iPhone hard drive from Windows/macOS. You can either add single files or a file folder directly to iPhone. 2. Drag and drop the file/folder to the flash drive window. 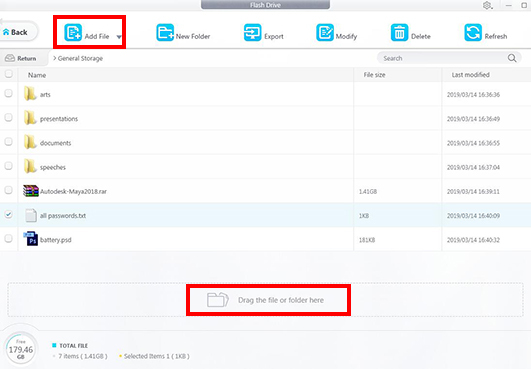 Note: You can also create new folders, export files from iPhone hard disk, select and modify a single file, and delete files. Your available iPhone storage will be shown on the left lower corner of the window with straightforward display of total file numbers. 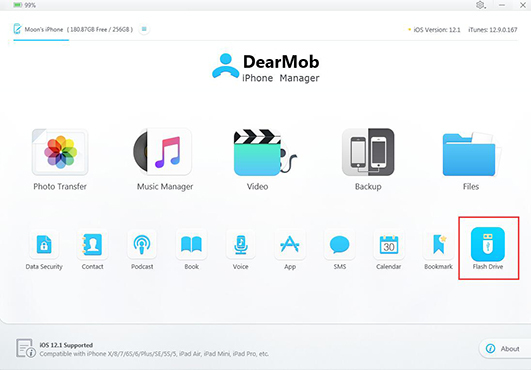 To fully enable iPhone disk mode, DearMob iPhone Manager is your totally-free and simple solution. It directly reads your iPhone hard drive from Windows and macOS devices and provides a slew of supporting tweaks. On top of this, the software also dishes other big features including iPhone video transfer, photo transfer, music transfer, app data transfer, imessages transfer and backup. With DearMob iPhone Manager, you will find overwhelmingly easy to manage iPhone data. DearMob offers tremendous options.